There are still a couple of days left in the month but I already have a list of reading events not to be missed. You’ve probably already heard of some of these but I’d love to hear if you are going to join in on the fun. I’m actually going to try and do all of these! I know, crazy right? Portrait Of A Lady readalong hosted by Dolce Bellezza. Have you read this classic? I tried reading this a long time ago and I think I may only have gotten through the middle of the book. Doing Dewey is hosting a quarterly read, Hunger by Roxane Gay. I already have this on hold at my library so I’m excited to read this. In honor of Black History Month, Brown Girl Reading is hosting #ReadSoulLit. Aside from reading Hunger, I also have another book that will fit in perfectly for this reading event. I’ll tell you about that in another post. 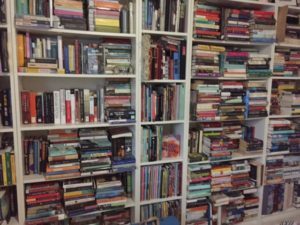 Finally, Jessie from Dwell in Possibility is hosting a Persephone Readathon between February 1 – 11. I’m so up for this readathon. I haven’t picked up a Persephone book in a while so it’ll be great to visit with these lovely books. I am not sure but I have 4 or 5 to choose from so I will let you know. January so far has been a great reading month (I’ll tell you more in a wrap up post soon) but it’s exciting to have these events to look forward to don’t you think? Let me know if you will join in some of these. Also, would love to hear if you know of any other reading events that are going on that shouldn’t be missed. It will be great to read Portrait of a Lady with you… I’m planning to join the readalong, too! I loved it many years ago, but it required quite a bit of concentration. (Hope I’m still up to it!) I plan to start in another week or so. I am so excited to read with you amd JoAnn and a few others! It is slow going, I am on page 125, but full of richness. I already have some passages underlined. 🙂 Good Luck on all of your quests, Iliana. I’m sticking with just catching up on my lengthy TBR list. You got my attention with the Hunger reading. I’ll have to take a closer look. I started reading Hunger last night. It’s both hard to read and impossible to put down! I didn’t know about #ReadSoulLit — thanks! I have a couple of books that will fit with that, too. I hadn’t heard yet about any of these reading events but they all sounds like fun! I hope that you are successful with all of them and have an amazing month of reading in February! Ooo, I missed the announcement about the Hunger readalong. I need to look into that! It’s been on my shelves for awhile, but just haven’t picked it up. I just picked up my copy of Hunger from the library this week. Should be a good read!